Considerable efforts in neuroscience research have focused on studying the differential contributions of the basal ganglia and the cerebellum to behavior. These subcortical structures perform many of their functions through interactions with the cerebral cortex. Although both the basal ganglia and the cerebellum influence many of the same cortical areas, they do so via distinct thalamic nuclei. As a consequence, they have been thought to be independent and to communicate only at the level of the cerebral cortex. In a Review recently published in Nature Reviews Neuroscience, Andreea Bostan and Peter Strick build upon their anatomical discoveries of two di-synaptic pathways linking the basal ganglia and the cerebellum to propose a novel framework in which these structures form nodes in a densely interconnected network. Figure: Anatomical connections between the basal ganglia and the cerebellum. a | A study using retrograde transneuronal transport of rabies virus in monkeys revealed a disynaptic pathway from the dentate nucleus (DN) to the putamen. Rabies virus was injected into the putamen and underwent retrograde transport to first-order neurons that project to the striatum (for example, neurons in the intralaminar thalamic nuclei) and then retrograde transneuronal transport to second-order neurons that innervate the first-order neurons. The second-order neurons in the cerebellum were located primarily in the DN. b | A study using retrograde transneuronal transport of rabies virus in monkeys revealed a disynaptic pathway from the subthalamic nucleus (STN) to the cerebellar cortex. 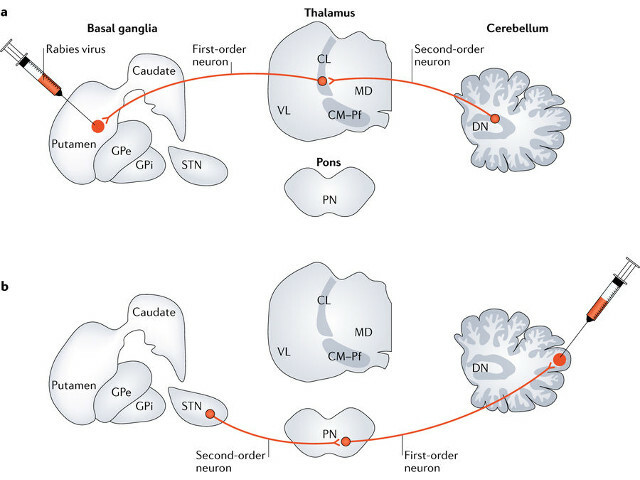 Rabies virus was injected into the lateral cerebellar cortex and underwent retrograde transport to first-order neurons that project to the cerebellar cortex (for example, neurons in the pontine nuclei (PN)) and then retrograde transneuronal transport to second-order neurons that innervate the first-order neurons. The study revealed second-order neurons labelled in the basal ganglia, primarily in the STN. Bostan and Strick provide a comprehensive overview of the recent literature that relates the anatomical pathways (Figure) with functional interactions between the basal ganglia and the cerebellum in rodents, non-human primates, and humans. They discuss evidence that the interconnections between the basal ganglia, the cerebellum and the cerebral cortex are topographically organized and create functionally distinct networks that operate over the domains of movement, cognition, and perhaps emotion. 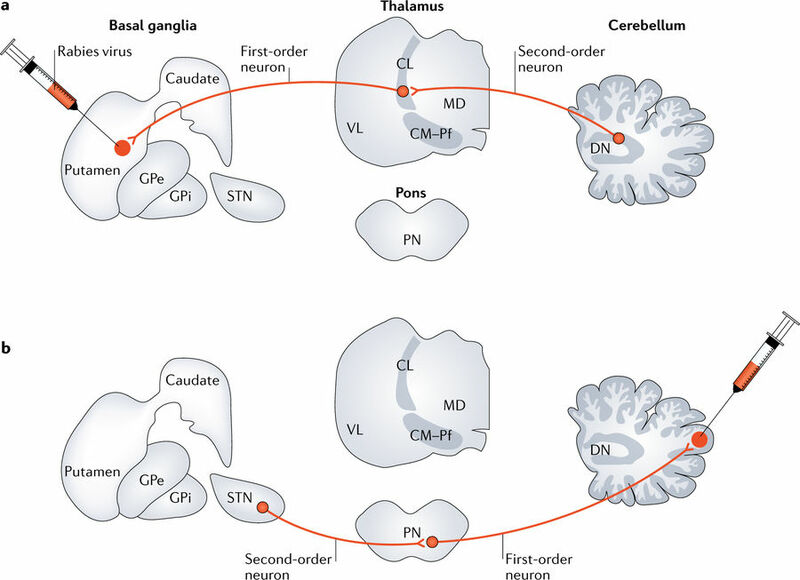 This perspective challenges basic neuroscientists and clinicians to move beyond considerations of basal ganglia- and cerebellar-specific tasks or disorders. Instead, they suggest that questions about basal ganglia or cerebellar function and dysfunction should be reframed to consider the entire basal ganglia–cerebellar–cerebral cortical network. Read more.